(File pix) Honda rider Marc Marquez of Spain celebrates his victory on the podium at the end of the Australian MotoGP Grand Prix at Phillip Island on Oct 22, 2017. 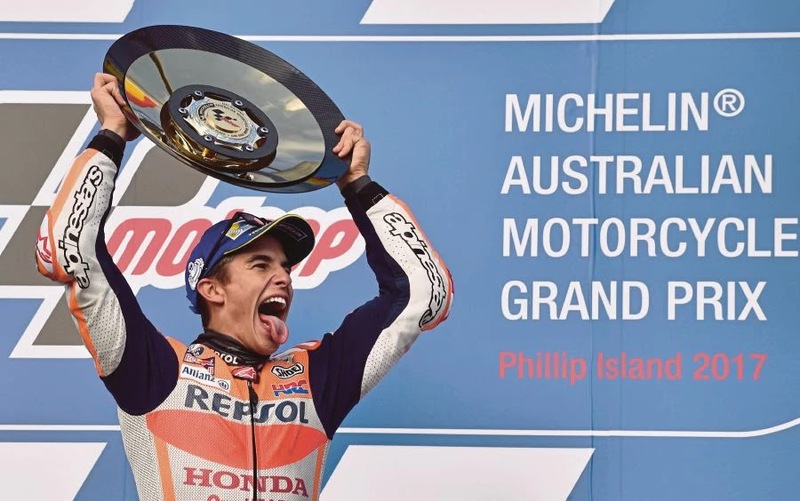 PHILLIP ISLAND (AUSTRALIA) - Marc Marquez has vowed not to be rash as he enters the final two races of the MotoGP season with a sizeable lead over title rival Andrea Dovizioso. The world champion Honda rider widened his gap over Dovizioso to 33 points with a hard-fought victory at the Australian MotoGP on Sunday. The Spaniard now heads to Malaysia for next weekend's penultimate race of the season knowing that the world title is his to lose. Only Dovizioso can overhaul him, but the Italian Ducati racer didn't do himself any favours by finishing 13th at Phillip Island. Dovizioso, who had revived his title hopes by beating Marquez in Japan a week earlier, won in steamy Malaysia last season. With a maximum of 50 points up for grabs in the last two races, Marquez can shut the door with another emphatic performance at Sepang. But he is wary of getting too far ahead of himself as the season builds to a climax. "The victory makes me happy with that 33-point advantage," he said after Sunday's win. "Okay, it's a big advantage but now is the time to understand our options, where we can fight to take points but not be too aggressive. "I've taken a lot of risks during the season, but now is the time to be more patient." He said his lead in the title hunt was "big, but not enough". "Now we need to approach the remaining races in a different way. We will try to give our maximum during practice in Malaysia and then in the race hold a little bit back for ourselves," he said. Sunday's victory was Marquez's 35th MotoGP win from 88 starts and his sixth of the year after he claimed his 44th premier class pole. It was the second for him at Phillip Island after crossing first in 2015. He has twice crashed out when leading in Australia. Dovizioso said his Ducati team had no option but to go all-out in Malaysia. "This year we've managed to improve many aspects and be competitive throughout the season," he said. "But when you come to tracks like this, where you don't brake very much and where there are lots of long, fast corners, some of our limits are magnified: in fact at Phillip Island none of the Ducati were very quick. "Pity, because at this point of the season it would have been better to be closer to Marquez in the standings. But now we have to think of Malaysia, where quite simply we'll have to give it our all."